This study was carried out in two research centres which are Centre 1 in Germany and Centre 2 in Ireland. In Centre 1, canning experiments were carried out by using blue whiting that had quality which was principal to be used as a raw material for canned products. However the quality was inferior when compared with commercial canned herring product in tomato sauce that is well accepted in German market. Centre 2 involved evaluation of the shelf life and sensory panel of blue whiting fillets. The blue whiting was sourced as block frozen fillets and individually quick frozen (IQF) fillets. They were tempered and evaluated as chilled fillets packed in modified atmosphere (MAP), or in air to assess their potential suitability for sale from chilled retail markets. Outcomes suggests that chilled Blue whiting fillets originating as block frozen or IQF samples have potential for sale in retail packs at 2-4°C, especially when packed in MA and when cooked by pan frying. These have a high quality shelf life of about 5 days at 2-4°C. Frozen breaded blue whiting goujons and nuggets were also well accepted. Further research was undertaken to observe some trace elements and cholesterol content in the muscle of blue whiting. Blue whiting (Micromesistius poutassou) is an abundant fish species in the North Atlantic, and elsewhere, and its potential as a human food has been investigated by a number of authors. Studies on blue whiting include tests on mince and gel formation (Perez et al., 2001), on cryoprotectants in frozen minces (Rodriguez et al., 2002), on surimi production (Trondsen, 1998), on protein hydrolysates (Ritchie and Mackie, 1982), on products made from blue whiting (Solovei, 1982; Connell and Hardy, 1982), and on taste panel acceptability (Afolabi et al., 1984). Other aspects investigated including the occurrence of parasites in blue whiting flesh (Levsen, 2005), the influence of catching season (Whittle et al., 1981), the effects of gutting (Huss, 1976), and the detection of lipid damage during frozen storage (Aubourg, 1999). The studies were carried at two different research institutes which are in Germany (Centre 1) and Ireland (Centre 2). These institutes are Federal Research Centre for Nutrition and Food, in Department of Fish Quality in Hamburg and Ashtown Food Research Centre in Ashtown, Dublin. The research and development arose from continuing requests from seafood processors for information on the use of non conventional fish species as an alternative to conventional ones. This is due the shortage of conventional fish species (mackerel, herring, cod etc) due to over fishing and the imposition of quotas. 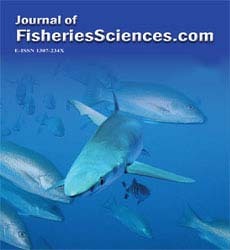 A number of studies have been reported on the utilisation of less well known fish species including large studies of Brennan and Gormley (1999), and Fagan et al., (2006). The research on blue whiting in Centre 1 dated back to the early 1970s when intensive research about so-called new food fishes including blue whiting as raw material for fish product development was funded by government (Christians, 1976). Later, from 1980 to 1983 intensive studies on blue whiting fillets as possible raw material for typical German canned fish products were undertaken at the former Institute for Biochemistry and Technology in the Federal Research Centre for Fisheries in Hamburg. The aim was to test blue whiting as a possible substitute for herring or other fatty fish species. The influence of different canning steps on the quality of the final product was studied, including thawing methods of frozen fish, steaming and cooking as pre-treatment prior to canning to reduce the water content, as well as the influence of pH and different sauces on taste and texture of the final canned products. Until now these results have only been published in the German language for the national fish canning industry (Karl, 1982 and 1984). Further investigations in Centre 1 were undertaken on the cholesterol content of blue whiting and on the content of the two toxic heavy metals that are cadmium and lead in edible part of fish as well as essential elements like copper and zinc. This work was carried out during a long term programme on the status of inorganic elements content in marine fish species. The research in Centre 2 involved evaluation of the shelf life and sensory panel of blue whiting fillets and products. The blue whiting were sourced as block frozen fillets and individually quick frozen (IQF) fillets. They were tempered and evaluated as chilled fillets packed in modified atmosphere (MAP) or in air to assess their potential suitability for sale from chilled retail markets. Freeze-chilled MAP raw fish fillets are increasingly popular in retail outlets in European countries (Fagan et al., 2004). The trial on products involved the evaluation of blue whiting as breaded goujons and nuggets both with and without spices. Trials on the utilisation of blue whiting (Micromesistius poutassou) have been taking place at the Federal Research Centre for Nutrition and Food (Centre 1), and Food Research Centre at Ashtown (Centre 2). Trials at Centre 1 embraced research on blue whiting as a raw material for canned products. Mechanically filleted, de-skinned and interleaf packed quick frozen fillet (7.5 kg) of blue whiting blocks were used as raw material for the canning experiments. The fish were caught by commercial freezing trawlers from South-East of Greenland in 1981 (Dohrn-bank). They were filleted on board and stored for 8-10 months at –28 °C to –30 °C until further processing in the laboratory. Data used in this study was obtained in 1981 and 1982. The industrial canning process includes several steps. The block frozen fish fillets are thawed, washed with tap water, transported via conveyor belt through a steam or cooking tunnel where the fillets are heated to 90°C to reduce the water content. The steamed or cooked fillets are automatically or manually portioned and placed into the open “Hansa” cans and then the sauce is added and the cans are closed. The cans are sterilised between 110°C and 121°C, and then cooled, dried and labelled. Water, ash and raw protein contents were determined according to Antonacopoulus (1973). Lipid content was not investigated since it is well known knowledge that blue whiting has a low fat content (< 1%). TMA-N, TMAO-N and DMA-N were determined by photometrical method according to Rehbein and Oehlenschläger (1982). Blue whiting were collected by fishery research vessels between 1988 and 2003. Sampling was done on Hatton Bank, West of the Shetland Isles, around Bear Island, Central Bank and North Cape Bank. Specimens were collected from the hauls, taken to on-board laboratory and dissected into edible part for later analysis on land. Samples were then frozen at –30°C and stored at –30°C until compositional analysis. Cholesterol in the edible part of blue whiting was analysed according to the method described by Oehlenschläger (2006). Analysis of cadmium, lead, copper and zinc was performed by Differential Puls Scanning Anodic Voltammetry (DPSAV) as described by Celik and Oehlenschläger (2004) and Celik et al. (2004). The research development arose from continuing requests from seafood processors for information on the use of non conventional fish species. There is shortage of conventional fish species (mackerel, herring, cod etc.) due to over fishing and the imposition of quotas. A number of studies have reported on the utilisation of less well known fish species including the studies of Brennan and Gormley (1999), and Fagan et al., (2006). Blue whiting samples were sourced as block frozen fillets, individually quick frozen (IQF) fillets, and as fillets from previously frozen round fish (i.e. entire fish with gut-in). The samples came from the same commercial catch and were landed at Killybegs, Ireland as part of an Irish Sea Fisheries Board (BIM) initiative to promote this species to both trawler men and to seafood processing companies. The raw fillets (280g portions) were packed in trays [110 x 150 x 55 mm (Dynopak Ltd)] (Dyno AF 320 antifog film) using an MAP machine (MECApac 500) in air or in 30% O2/40% CO2/30 %N2 as described by Fagan et al., 2004. All samples were, in fact, freeze-chilled as they originated from frozen fillets/round fish and were then tempered at 2-4°C to chill for these tests. The block-frozen and IQF fillets were tempered to chill temperature (2-4°C) in the MAP packs and the thaw water was measured as gravity drip (GD) on the different test days. The round fish were thawed in-factory, filleted, and sent chilled to Centre 2 for inclusion in air or MAP packs. In this case the thaw water was not included in the GD value. In addition, the thawed round fish fillets were 1 day in chill temperature during transit to AFRC which means that test days were 0, 3, 5 and 9 (in reality) for the round fish fillets days were 1, 4, 6 and 10. This should be borne in mind when interpreting the data in Tables 3 to 6. The samples were evaluated in triplicates on days 0, 3, 5, and 9 (1, 4, 6, 10 for round fish fillets) from chill storage at 2-4 ºC. Tests were conducted for colour (Hunter Lab), gravity drip, total volatile base nitrogen (TVB-N), total viable count (TVC) and sensory assessment as described by Fagan et al., (2004). The trial design was 3 raw materials (block frozen blue whiting fillets; IQF fillets; fillets from previously frozen round fish) x 2 atmospheres (30% O2/40%CO2/30% N2 vs air) x 4 test days (0, 3, 5, 9) x 3 replicates with 71 df (ANOVA). The samples for sensory tests were evaluated by 8 trained taste panel that are experienced in tasting fish. The fish fillets were pan fried (with a trace of oil) and were assessed for acceptability on a 6- cm line with end-points of unacceptable (0) and very acceptable (6) commonly used in our laboratory. Trials in the goujon and nugget on blue whiting were prepared from IQF fillets. These were tempered to 4°C in a chill room overnight. The following day the skin was removed and the fillets were cut into goujons (circa 30 g). Some fillets were also minced and shaped into nuggets in ice cube trays; the nuggets in tray were then crust frozen (blast freezer; -35°C/20 min) to consolidate their shape. These and the goujons were predusted and dipped in batter (± spices), covered with bread-crumbs (National Food Ingredients, Ireland) and flash-fried in oil (190oC/20 sec). They were placed in plastic bags, vacuumed, and blast frozen (190oC/2 h) followed by storage at -20°C. Samples were removed and tested after 1, 2 and 3 months. Tests were conducted for sensory assessment, TVC, colour (Hunter Lab), moisture and TVB-N as described above for fillets. The samples for sensory testing were finish-fried in oil (190 °C/4 min). The German fish canning industry favourably uses skin-on herring fillets as raw material for the production of a variety of canned products due to the high fat content of this species. The most common canned product in Germany is herring fillets in tomato sauce, sometimes with the addition of spices and vegetables. This product is typically produced in oval aluminium cans with ring pull lids, so called “Hansa” cans, containing 110 g of fish meat and 80-90 g of sauce and other ingredients. Annually approximately 355 millions of fish cans are produced in Germany. Fillets used as raw material for canning must have a fat content of at least 6-8 % to avoid them becoming firm and dry. Blue whiting is a lean fish species with a low fat content of less than 1%. To obtain an acceptable canned product despite the low fat content compared to herring, every single canning step was checked in respect of mass loss, texture chances, chances in chemical composition and pH-value. The canned products were assessed by sensorial test with specially focus on texture. The first part of the investigation dealt with the influence of thawing and heat pre-treatment on blue whiting fillets. Different thawing methods had little influence on the texture of the fillets (results not shown). The methods studied included thawing of fillet blocks stored overnight at 4°C to a core temperature of –2°C and then final thawing with or without water contact. Finally thawing under dripping water (16°C) for 2-3 h was chosen as the best method as it turns out that the thawing time can be controlled best. The heat pre-treatment experiments showed that cooking of fillets in a water bath for 20 min at 90°C was preferable to steaming the fillets at 90°C. Cooking resulted in a relative mass loss of approximately 20-30 % and a reduction in water content from initially 82 % to 76 % (Table 1). Cooking process reduced the TMAO-N content more effectively than steaming from initially 97 mg/100g to 36 mg/100g and the overall increase in TMA-N and DMA-N was less. Texture measurements also revealed significant differences between both treatments. The texture of cooked blue whiting fillets was less firm than the steamed fillets. Pre-cooked fillets were used in the canning experiments. To get a close mix between sauce and fillets, the cans were first bottom filled with half of the sauce (45 g), the fillets (120 g) were manually placed on top of the sauce and then covered by the other half of the sauce. All sauces had a fat content of 25 %. The canning experiments showed that the texture of canned Blue whiting fillets was mainly affected by the pH value of the sauce and by the type of sauce. The pH value of a canned fish product can be adjusted by the pH of the sauce. Commercial canned herring fillets in tomato sauce show pH values of 5.0 to 5.6. Lower pH values can result in firm textures. The effect of pH values between 4.46 and 6.94 on the texture of canned Blue whiting fillets in tomato sauce is shown in Figure 1. Five sets were produced with increasing sauce pH values. All sets were stored for three months at ambient temperature before analysis to allow an equalization of the pH between sauce and fillet. A direct correlation was found between the pH value of the fillets and their firmness. The sensory panel scored fillets with low and high pH values as both unacceptably hard and dry, or too soft and mushy (results not shown in detail). Only fillets with pH values around 6.0 were assessed as acceptable but still as rather dry and crumbly compared to the optimal reference product, canned herring in tomato sauce. The type of sauce also affected the texture and the chemical composition of the canned Blue whiting. Comparing canned blue whiting fillets in tomato sauce with fillets in mustard sauce or other commercially available creamy white sauces, the fillets in sauces without addition of tomato concentrate exhibited a significantly softer texture and a lower TMA-N and DMA-N contents (Table 1). To overcome the influence of the pH value on the texture of the fillets, all sauces were adjusted to a pH around 6 before preparation of the canned products. The addition of tomato concentrate to sauces obviously catalysed a partial decomposition of the remaining TMAO of the Blue whiting fillets to form DMA, TMA and consequently also formaldehyde which hardens the flesh. These results are supported by the fact that a continuous decomposition of the TMAO and formation of TMA and DMA was observed during long-term storage of canned Blue whiting fillets in tomato sauce. After one year of storage the TMA-N and DMA-N contents had increased to 15 mg/100g and 12.5 mg/100g, respectively. A similar increase of TMA was reported by Taguchi et al. (1982) during storage of canned mackerel. Canned blue whiting fillets without tomato sauce did not show this decomposition during storage. The cholesterol content of 31 specimens of Blue whiting from different fishing grounds was 39.5 ±6.3 mg/100g wet weight. No large variations were detected in fish from different catching grounds. Maximum and minimum values of 27 mg/100g and 49 mg/100g were found. This cholesterol content in Blue whiting fillets matches the average cholesterol content found in a comprehensive investigation of cholesterol content in the edible part of marine fish species from North Atlantic waters where an average of 40 mg/100g was found (Oehlenschläger, 2006). The concentrations of trace elements investigated in fillet of blue whiting are presented and summarised in Table 2. Contents of the toxic heavy metals cadmium and lead were low and far below legal limits in European Union (0.3 mg/kg for lead and 0.05 mg/kg for cadmium in muscle tissue of fish). Statistics are calculated without values for lead content in six blue whiting specimens caught in 2003 on North Cape Bank in Northern Norway. These specimens exhibited a lead content significantly higher than that in all other specimens investigated (34.1 ±20.5 μg/kg wet weight). These concentrations were still well below legal limits (about 10% of limit). Reasons for this elevated level are unknown but most probably the fish fed on lead-containing zoo- or phytoplankton. The fillets of Blue whiting showed an average content of the essential element zinc comparable with other marine fish species and only contribute minimally to the dietary supply of copper (Oehlenschläger, 1997). Block frozen fillets were whitest and those from round fish the least white (Table 3). However, the latter were a day older than the others (see Materials and Methods and Table 3). In general MAP fillets were whiter than those in air and samples were whiter on days 3 and 5 than on days 0 and 9. This led to a statistically significant interaction. The mean whiteness value (L=48) was lower than that of cod (65) or silver smelt (61) (Gormley, 2006), but was fairly similar to that (L=51) of whiting (Merlangius merlangus) (Fagan et al., 2003). Gravity drip (GD) values were highest (P<0.001) for fillets originating from blocks (17.2%) and lowest for those from round fish (5.5%) as were samples from MAP (13.2%) versus air (8.9%) (P<0.001). While these data suggest that freezing round fish may be the best option for minimising drip, this may not be the case. The round fish were thawed in-factory prior to sending to Centre 2 and this thaw water was not included in the GD value. The mean GD values were relatively similar from day to day but were higher than those reported for freeze-chilled whiting fillets (Merlangius merlangus) (Fagan et al., 2003); similarly for the GD from the MAP samples (Fagan et al., 2004). These data suggest that in-pack drip pads may be necessary for most of the treatments to soak up the exudates. Fillets originating from round fish had the highest TVB-N values (Table 3). This was expected as these samples were a day older than the fillets originating from block or IQF frozen fish; i.e. days 0, 3, 5 and 9 were days 1, 4, 6 and 10 for fillets originating from round fish (see Materials and Methods). 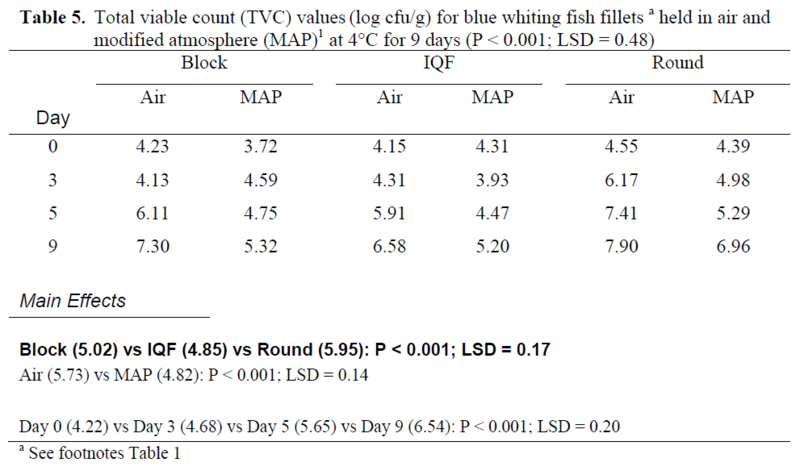 MAP out-performed (lower TVB-N values) air over time (especially for fillets from round fish) and this was manifested by a statistically significant interaction (Table 4). However, this contrasts with the findings of Fagan et al., (2004) who showed that MAP did not influence the TVB-N values of freeze-chilled whiting (Merlangius merlangus) or salmon fillets. 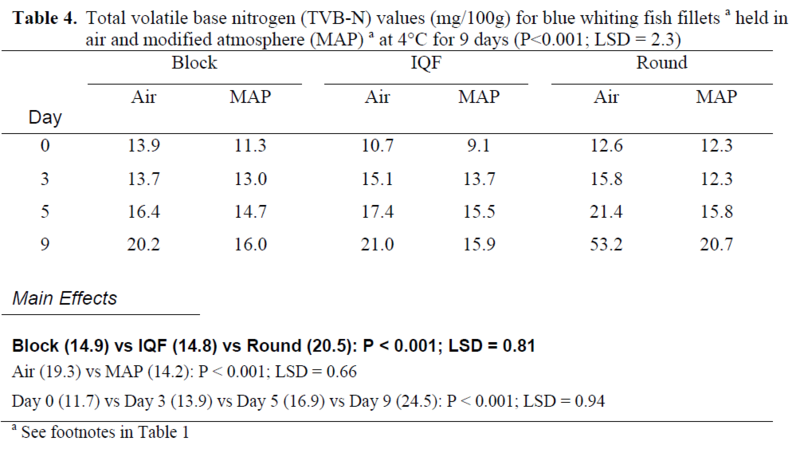 The TVB-N values increased over time in the current study but the values were well below the upper limit of 35 mg N/100g flesh cited in EC Directive 95/149/EC (1985) except for round fish in air (Table 4) on day 9 (10) where the value was 53.2 mg N/100g. Fillets originating as IQF had the lowest TVCs and round fish fillets the highest (Table 5). However, the latter were a day older at the time of comparison (see above, and in Materials and Methods). MAP out-performed air over time in that the former kept TVCs lower for a longer time period than the latter (Table 5) and this led to a statistically significant interaction; mean TVC values increased over the 9-day test period. This is similar to the findings for freeze-chilled whiting, salmon and mackerel in MAP (Fagan et al., 2004). The Department of Health and Children in Ireland (1992) suggest an upper TVC limit of log105cfu/g for the sale of raw fish fillets, and guidelines are in place. Based on this figure, fillets (originating from block frozen or IQF) have a shelf life (from a TVC standpoint) of about 5 days in MAP and 3-4 days in air. 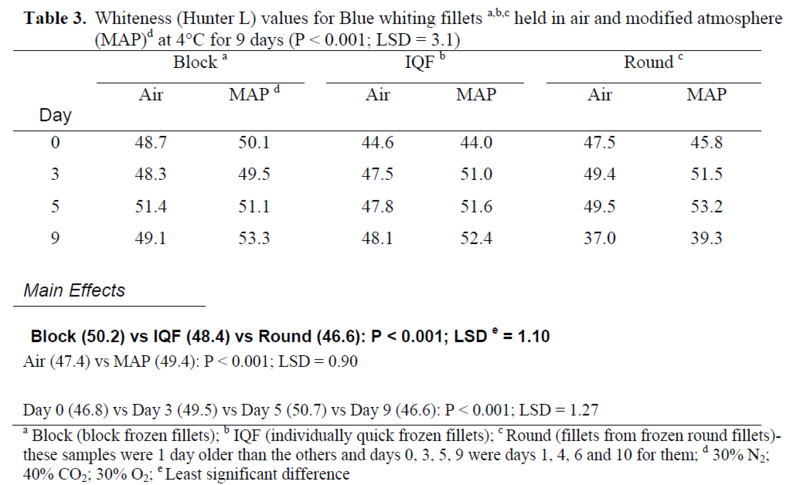 However, fillets from round fish had a shelf life of only 3 (4) days in MAP and even less in air (Table 5). These data show that MAP is particularly effective in controlling TVCs in Blue whiting. Barassi et al. (1981) reported that postspawning Blue whiting iced fillets loses quality within 6 days of catching but that gutting postspawning fish increased shelf life by an additional 2 days. In contrast, they found that whole fish, pre-spawning, have a shelf life on ice of up to 12 days. All samples (pan fried fillets) received good sensory acceptability scores (>4) (Table 6) on day 3 on a scale ranging from unacceptable (0) to very acceptable (6). However, only the MAP samples scored >4 on day 5. Fillets originating from round fish got the lowest acceptability scores but these were a day older than the other samples on each day of testing. Samples were not tasted on day 7 due to high TVCs on the raw fillets (Table 5). Mean scores were equal for days 0 and 3 and fell by day 5. However, the differences between the treatments, overall, were small in practical terms. 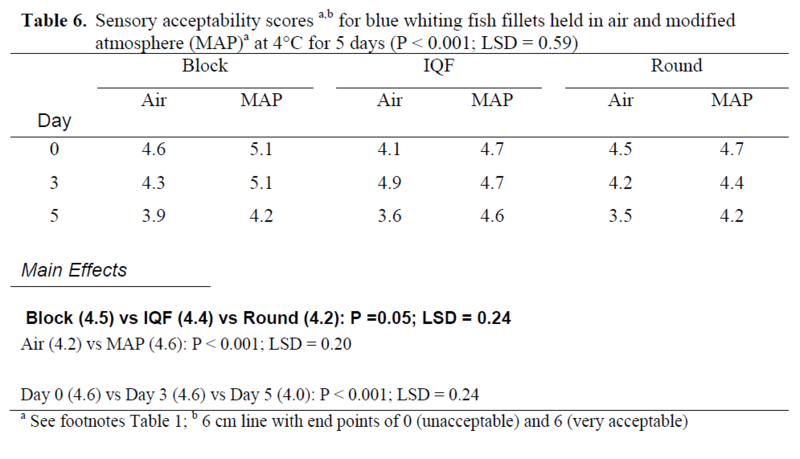 Acceptability scores >4 were also obtained (Trial 2) for the deep fried goujons and nuggets from Blue whiting, and none of the scores were significantly different from each other. The scores [6-point scale with end-points of unacceptable (0) and very acceptable (6)] were goujons (4.67), goujons with spice (4.9), nuggets (4.69) and nuggets with spice (4.6). The mean scores over the period of storage at minus 20 °C were 4.65 (1 month), 4.75 (2 months) and 4.74 (3 months). TVCs for these samples were different (P<0.001) but all values were low with means ranging from 2.69 to 3.9 log10cfu/g. These samples had been par-fried and the TVCs would be lower still after finish-frying. The sensory data for the pan fried fillets, and the deep fried goujons and nuggets, show that these Blue whiting samples were well accepted by the panellists. Hamilton and Bennett (1984) reported that Blue whiting was much less acceptable than whiting as steamed samples because of its greyish appearance but was well liked by the assessors when incorporated into processed products. However, this problem was overcome in the current tests by pan frying which gave a cooked product with a good appearance. Afolabi et al. (1984) found that breaded fingers of cod scored consistently better than Blue whiting fingers, and the time in the season at which the fish were caught was also a factor. They also showed that the acceptability of Blue whiting breaded fingers remained remarkably constant during storage at - 15°C. The correlation coefficients between the various test variables in the current trials were generally small with the exception of TVC x sensory acceptability score (-0.71), TVC x TVB-N (0.71), and TVB-N x sensory acceptability score (-0.56). A comprehensive study was undertaken in Centre 1 to use blue whiting fillets as raw material for canned products, applying different sauces and different processing conditions. The quality of the resulting products was generally poor and not comparable with the traditional canned herring or mackerel products being on the market. The low fat content being typical for this species led to a texture in the final canned Blue whiting products described as dry, firm, and crumbly, regardless of the sauce added. The relatively high TMAO content of the raw material can lead to increased TMA and DMA contents after canning and during storage, especially if tomato sauces are used. Blue whiting is a lean fish species with low cholesterol content in its edible part in the range of 40 mg/100g. It is generally low in toxic heavy metals cadmium and lean and is a good source of zinc and a moderate supplier of copper in the human diet. The findings from Centre 2 suggest that chilled blue whiting fillets originating as block frozen or IQF samples have potential for sale in retail packs at 2-4 °C, especially when packed in MA, and when pan fried. These have a high quality shelf life of about 5 days at 2-4 °C. Frozen breaded blue whiting goujons and nuggets were also well accepted. These findings suggest that blue whiting is a potential species for sale as chilled fillets at retail, especially with the reduced availability of other species. Aubourg, S.P., (1999). Lipid damage detection during the frozen storage of an underutilised fish species. Food Research International, 32(7): 497-502. Celik, U., Oehlenschläger, J., (2004). Determination of zinc and copper in fish samples collected from Northeast Atlantic by DPSAV. Food Chemistry, 87: 343-347. Celik, U., Cakli, S., Oehlenschläger, J. (2004). Determination of the lead and cadmium burden in some North-eastern Atlantic and Mediterranean fish species by DPSAV. European Food Research and Technology 218: 298-305. Christians, O., (1976). NeueNutzfische (New food fishes). Federal Ministry for Research and Technology, BMFT-FB M 76-03, 97 p.
Connell, J.J., Hardy, R., (1982). Trends in Fish Utilisation (ISBN 0-85238-120-4). Fishing News Book Ltd, Farnham, Surrey, UK. Department of Health and Children (Ireland) Guidelines (1992). Microbiological guidelines for fish. Total viable counts for raw and cooked seafood products. Fagan, J.D., Gormley, T.R., Mitchell, M., (2006). Adding value to underutilised fish species. End-of-Project Report, Teagasc, Dublin, Ireland, ISBN No. 1-84170-459-3, 32 pages. Fagan, J.D., Gormley, T.R., UiMhuircheartaigh, M.M., (2003). Effect of freeze-chilling in comparison with fresh, chilling and freezingon some quality parameters of raw whiting, mackerel and salmon portions. Lebensmittel- Wissenschaft und-Technologie, 36: 647- 655. Fagan, J.D., Gormley, T.R., UiMhuircheartaigh, M.M., (2004). Effect of modified atmosphere packaging with freeze-chilling on some quality parameters of raw whiting, mackerel and salmon portions. Innovative Food Science and Emerging Technologies, 5: 205-214. Gormley, T.R., (2006). New fish species: the 3- way challenge of supply, adding value and consumer acceptance. FoodInfo Online (IFIS) www.foodsciencecentral.com/fsc/ixid14338, May: 3 pages. Hamilton, M., Bennett, R., (1984). Consumer preference for white fish. Journal of Consumer Studies and Home Economics, 8(3): 243-249. Huss, H.H., Asenjo, I., (1976). Storage life of gutted and ungutted white fish. Årsberetning, FiskerministerietsForsørgslaboratorium, Lyngby, Denmark, 32-48. Karl, H., (1982). UntersuchungenzumGewichtsverlust von Filets des BlauenWittlingsbeimBlanchieren und Dämpfen. InternationaleZeitschriftfürLebensmittel-technik, Marketing, Verpackung und Analytik, 33(5):373-377. Karl, H., (1984). DauerkonservenausBlauemWittling (II). Veränderungen der Zusammensetzung und der Textur von Filets des BlauenWittling (Micromesistiuspoutassou) während der VerarbeitungzuDauerkonserven. Fleischwirtsch, 64(4): 487-489. Karl, H., Schreiber, W., (1985). Texture analysis of canned fish. Journal of Texture Studies, 16: 271-280. Oehlenschläger, J., (1997). Marine fish – a source for essential elements?! In: J.B. Luten, T.Børresen, J.Oehlenschläger (editors). Seafood from producer to consumer, integrated approach to quality. Development in Food Science, 38: 641-652. Oehlenschläger, J., (2006), Cholesterol content in seafood, data from the last decade: A review. In: J.B. Luten, C. Jacobsen, K. Bekaert, A. Sæbø, J. Oehlenschläger (editors). Seafood research from fish to dish. Wageningen Academic Publishers, 41-57. Paulus, K., Gutschmidt, J., Fricker, A., (1969). KarlsruherBewertungsschema- Bewertung, anwendbarkeit, Modifikation. LebensmittelWissenschaft und Technologie, 2: 123-129. Perez, M.M., Hurtado, J.L., Montero, P., Fernandez, M.F., (2001). Interactions of kappacarrageenan plus other hydrocolloids in fish myosystem gels. Journal of Food Science, 66(6):838-843. Rehbein, H., Oehlenschläger, J., (1982): ZurZusammensetzung der TVB-N-Fraktion (FlüchtigeBasen) in saurenExtrakten und alkalischenDestillaten von Seefischfilet. ArchivfürLebensmittelhygiene, 33(2): 44- 48. Rodriguez, H. J., Pastoriza, L., Sampedro, G., (2002). Effects of various cryostabilisers on protein functionality in frozen-stored minced Blue whiting muscle: the importance of inhibiting formaldehyde formation. European Food Research and Technology, 214(5): 382-387. Trondsen, T. (1998). Blue whiting surimi: new perspectives on the market value. Fisheries Research (Amsterdam. The Netherlands), 34(1): 1-15.